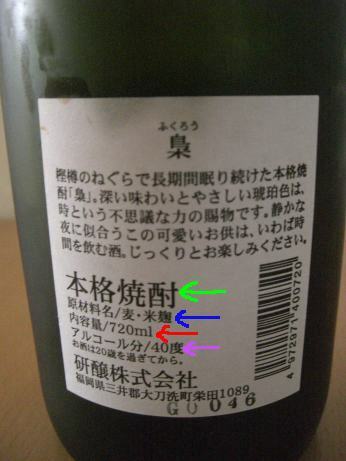 Most shōchū bottles are covered in a mass of Japanese characters that for many Westerners will look completely inaccessible. At first sight, many people will find it difficult even to distinguish the sake shelves in a Japanese supermarket from the shōchū ones. I believe this is one of the reasons why this incredibly rich corner of the the world of distilled spirits has remained terra incognita for most people outside Japan and many foreigners within it. First, some bad news. Both of the bottles above are mugijōchūs. There appears to be no standardization at all in the types of bottles used for shōchū. The bottle on the right, in particular, could easily be a sake. You are going to have to look closer to get any information. I recommend a "hit and run" mentality: accept from the outset that you are not going to understand everything on the bottle. After all, most people don't understand everything on a French wine bottle. They just know a few key phrases and hunt for them on the label. Can you spot them? The characters on the gold label were introduced in Lesson 1. The read "honkaku shōchū", the type of shōchū we are looking for. It is not always made easy to spot what we are looking for. The characters on the right column of the pottery bottle are the same! I am afraid that is the way it is going to be. About 5 to 10 per cent of bottles are just going to pass you by if you are a novice. Using our "hit and run" technique we can just skim through that big block of verbiage at the top there. It is just scene setting (although if you look closely, you might find at least four familiar characters). The vital information is below it. The green arrow points to the now familiar "honkaku shōchū" characters. The red arrow is the next piece of the jigsaw. It is typical to display the ingredients in this way. It says "Ingredients/barley, rice kōji". So this is a mugijōchū made with a rice kōji. I think you will be able to work out what the red arrow text is. And what might a "40" on a spirits bottle be referring to? Alcohol content, perhaps? This is a relatively strong shōchū.